Frodo: I wish none of this had happened. Gandalf: So do all who live to see such times. But that is not for them to decide. All we have to decide is what to do with the time that is given to us. There are other forces at work in this world, Frodo, besides the will of evil. For anyone who isn’t as much of a geek as I am, this is a bit in The Lord of the Rings where Frodo, a peaceful, quiet little fellow is questioning and regretting everything that’s happened, leading him away from his idyllic tranquil life on this crazy dangerous adventure to destroy an evil ring for the good of Middle Earth (No, wait, stick with me here, I’m gonna make a good point). Gandalf’s a wizard, so he’s bound to be super wise, but this is a message that I think transcends a fantasy world and actually has a message applicable here in 2019 in the real world. “…all who live to see such times”, times such as depression, self-loathing, self-harm, doubt in yourself, or just generally bad things happening to you out of your control, of course you’re gonna wish none of that had ever happened. But once it has (and here’s the real bummer) there’s nothing you can do to change the fact that something bad has happened. Sometimes stuff is just out of your control, and accepting that it’s happened, and you can’t change that fact is the first step you often have to take on a journey to getting better from it. But what you CAN decide is “…what to do with the time that is given to us”. Let’s face it, life’s actually pretty short, and if we’re being honest with ourselves, none of us really want to stay despondent. When bad things happen, even if you can’t control them happening, you can control what you DO about it. You could decide to let it take over you, and beat you down, and leave you miserable, stuck in a negative spiral. Or, you can decide to do something about it; to not let it define you and take control of your life. To be clear: depression (or any mental health issue) isn’t a choice. It’s how you react to it that you have a choice over. Take steps to get through a tough time, like pick up the phone and call a friend, or a helpline, or book in to go see a counsellor. Find some activity that allows you to express yourself, and get into a better headspace; be it listening to music, writing, playing an instrument, drawing, running, meditation, anything that helps you feel better in a way that doesn’t damage you any more. You can find a bunch of things to try here. From my experience, actually doing SOMETHING about a bad situation makes me feel better than just sitting and letting it get to me in my head. I felt totally overwhelmed by all sorts of crummy life problems recently, and freaked out a little bit, until I stopped, and wrote down all the things that were bothering me, and what I could realistically do about them all. Getting this kind of order in my life helped me to gain perspective on everything, and realise what I could do to fix myself and my problems. Even though some things were simply out of my hands, realising and accepting that fact meant I could deal with the crap, and move on. “There are other forces at work in this world, [and in THIS world, as well..], besides the will of evil”. And actually, this is true. A while ago a did this #100happydays challenge (and then on to 365 happy days), which isn’t about showing off how great your life is. It’s about stopping and looking for something positive, and worth being happy about every day. Some days that’s way easier than others, but the truth is, if you look hard enough, and make a conscious effort to stop and think about it, you can find good things about days that may seem like a total write off. There’s so much other stuff going on in your life, other than the bad things happening to you. It’s insanely hard to think about it that way when you’re under attack from the world – I know; I’ve been there. But realise that there are good people around you, more than willing to help you. So I’m going to challenge you: what are you doing with the time you’ve got? On average, you’re awake 112 hours a week. So what are you going to do with your 112 hours? If you’re feeling low right now, are you going to stay low for another 112 hours? Or are you going to refuse to sink and find something – however small – to get you through the day. Get better, and do it for yourself. It won’t necessarily be quick or easy, but it’ll mean that the time you have will be enjoyed, and made the most of, rather than regretting and questioning stuff that you have no control over. And if you find yourself needing to destroy a ring for the good of Middle Earth, make sure you have a wizard with you. 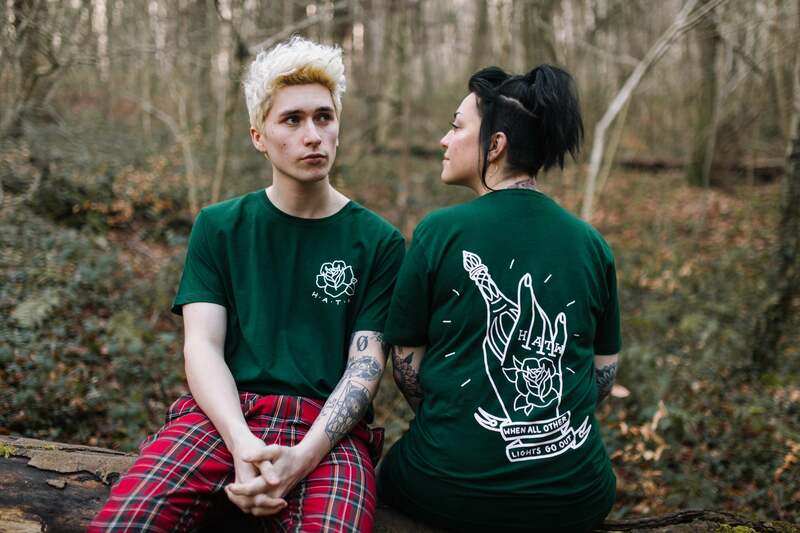 If you’re into Lord of the Rings geekery, posi messages and sweet tees, then you should definitely cop our LOTR inspired tee.